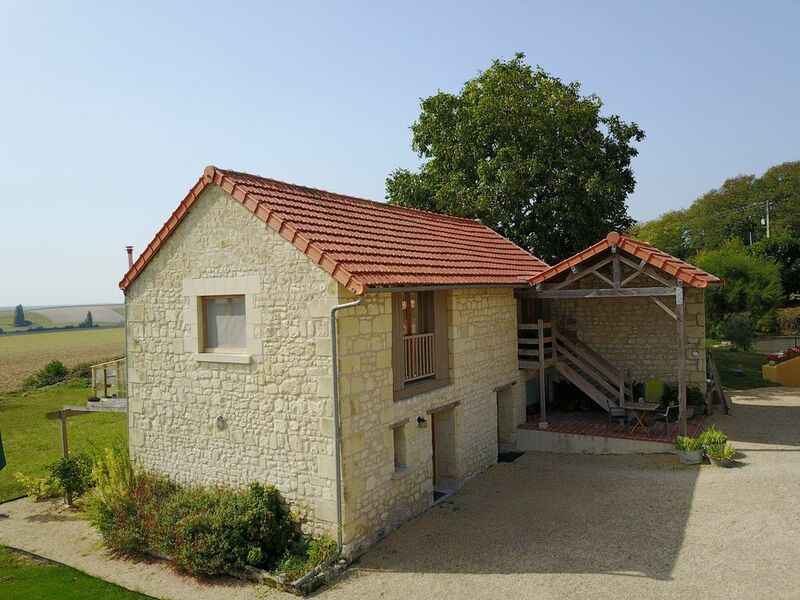 In the heart of the Loire Valley, ten minutes from the fortress city of Chinon and the Royal Abbey of Fontevraud, located in a tranquil valley with spectacular views, this renovated, 18th Century stone barn was new to the rental market as of April, 2011. Many of the grand Chateaux of the Loire Valley: Villandry, Chenonceau, Usse, Azay-le-Rideau and Saumur are easy half-day trips. For cycling enthusiasts, we are less than a kilometre from the main bike route through the Loire Valley; and for food and wine enthusiasts, the Loire Valley, is known as the 'garden' of France. We are surrounded by the vineyards of Chinon, Bourgueil and Saumur which produce some of France's finest wines and best values. From its famous chèvre, the mushrooms of the troglodyte caves of Saumur, to the white asparagus grown in sandy Loire soil, the region offers a rich bounty. Your hosts, former restaurant owners from San Francisco, are available to cater meals and conduct local food and wine tours. Chinon Château: The mount of Chinon was first fortified as a stronghold by Theobald I, Count of Blois in the year 954. In the 12th century Chinon was then independent of the kingdom of France, and was a primary residence of Henry II Plantagenet, Angevin King and King of England. King Henry died in Chinon Castle after being defeated by his sons Richard and John in a rebellion aided by Phillip Augustus of France; he, his wife Eleanor of Aquitaine, and their son King Richard the Lionheart were all buried at nearby Fontevraud Abbey. Later, the château was a residence of Charles VII, the Dauphin of France in the early 15th century, when Joan of Arc arrived at the castle, at the beginning of her quest to liberate France from the English on March 8, 1429; it was here that she recognized the disguised Dauphin from amongst his courtiers, a feat which helped to persuade him to accede to her urging to declare himself king and raise an army to liberate France. A visit here is a must for any history buff. Royal Abbey of Fontevraud: The Abbey was founded in 1100 by Robert of Arbrissel, who had just created a new order, the Order of Fontevrault. The first permanent structures were built between 1110 and 1119. The abbey was a double monastery, with both monks and nuns on the same site. An international success, the order established several 'Fontevrist' abbeys set up in England. Robert of Arbrissel declared that the leader of the order should always be a woman and appointed Petronille de Chemillé as the first abbess. She was succeeded by Matilda of Anjou, the aunt of Henry II of England. This was the start of a position that attracted many rich and noble abbesses over the years, including members of the French Bourbon royal family. In the early years the Plantagenets were great benefactors of the abbey and while Isabella d'Anjou was abbess, Henry II's widow Eleanor of Aquitaine became a nun there. During the French Revolution, the order was dissolved. The restoration of the abbey church was finished in 2006. Wines of Chinon: The red and rosé wines of Chinon are made from the Cabernet Franc grape, and are typically dry and light to medium bodied and go well with food. In good vintages the red wines can be cellared for 10 years or more. Cabernet Franc grown on the stony terraces of the area tends to be a young wine with dominant notes of blackcurrant and anise. Though typically thought of as lighter wines, reds from good producers and strong vintages can be full bodied and well structured for aging. Their white wines, though lesser known, are quite good and are made from Chenin Blanc. Two of the more noteworthy vintners of Chinon, and well worth a visit, are Bernard Baudry and Charles Jouguet. Wine tours are available through your hosts. Expat Americans living in France since 2004, after renovating an abandoned farm property in the Loire Valley, we have opened our home to traveling guests so they can have a comfortable and luxurious base for exploring the Loire Valley. Ask about our Paris apartment rental too. If you are visiting the Loire Valley, we are centrally located, most of the major sites are within easy reach. Just 10 minutes from the fortress city of Chinon, where one finds all needed services, we are in a quiet, breathtaking setting on 10 acres, with no immediate neighbors. All the comforts of home, and more. Renovated to the highest international standards, you'll not want for any comfort. A large and luxurious bathroom with plenty of hot water, a gourmet kitchen with every imaginable cooking item, a dvd library of more than 500 films and documentaries, books galore. In short, you will want for nothing. The over-sized bathroom has a walk-in Roman shower and views of the surrounding fields. Agricultural valley with views to a Renaissance Chateau on the opposite ridge. Chinon and Fontevraud just 10 minutes. Saumur 25 minutes, Tours 45 minutes. The Loire and Vienne Rivers minutes away. Satellite system, not super fast but very reliable. Unlimited emails, web-surfing, etc. Not suitable for streaming video or visual calls, except during certain hours. Please ask. Extensive collection of whatever one might need. Anything else on request. Extensive collection of everything on hand. Multi-course dinners with all wines available with advance planning at 40 euros per person. Food and wine tours and cooking classes are also available. Multiple outdoor venues, covered or not. Owners also have an apartment in Paris, central-north of the old Opera in the 9th, available for rent. If you happen to be visiting this most scenic part of France, don’t miss the opportunity of staying in this beautifully restored old stone barn. The interior is absolutely perfect, from the gourmet kitchen to the tiled bathroom to the leather chair and sofa to the most comfortable bed. Steve and Tim really did this rehabilitation right. The owners are so thoughtful that when we arrived after a long transatlantic flight and the drive down from Paris, they had provided us with enough supplies for breakfast in the morning and a great little meal that night. We did not have to push our tired bodies out again to shop for anything until the next day. So much appreciated. In short, don’t pass up the opportunity to stay with these great hosts. You will not regret it. We recently had the pleasure of staying four nights during our first trip to the Loire. Our goal was to find a quiet place to return to each evening after heading out to explore the beautiful Loire sights and towns during the day. We can't imagine a more perfect fit. Tim and Steve have created a luxury accommodation, not only in design and furnishings, but one that sits in a most beautiful setting as well. What a joy it was preparing evening dinner in our well equipped kitchen after gathering local products at town markets. Beautiful outdoor sitting areas to enjoy it all as well. And then there's Tim and Steve. Two of the nicest, most accommodating hosts we've met in our travels. Amazingly helpful advice and recommendations leading up to and during our stay. We truly hope to return some day as four nights was not nearly long enough. We were in France for two weeks of cycling and sight seeing and we spent the latter 4 days of our holiday at The Old Barn, Lerne. From the moment of our arrival we had a wonderful welcome from our hosts, Steve & Tim. The property is extremely comfortable and furnished and equipped to a very high standard. Steve & Tim have placed great emphasis on attention to detail and luxury. This gave us a “home from home” experience, making our comfort and relaxation as their guests their top priority. Regardless of any weather conditions The Old Barn has it all covered, Steve & Tim have thought of everything! We arrived at the property on a Sunday evening and we had overlooked the fact that all shops and local amenities were closed. However, Steve & Tim had gone to great lengths to ensure that we had plenty of supplies to keep us going, including a delicious home cooked meal and a bottle of wine for the evening of our arrival and an array of fresh produce for our breakfast the following morning. We were able to relax immediately and enjoy our beautiful surroundings! The guys are extremely generous and friendly hosts and also made sure we had a secure place to keep our bikes when they were not in use. For anyone wishing to stay in a quiet rural location in the Loir Valley with stunning open countryside views and a huge helping of luxury accommodation with lovely charismatic and welcoming hosts we can highly recommend this property. Thank you Steve and Tim for our extremely memorable stay at The Old Barn. My husband and I stayed in this 18th Century Stone Barn in May, 2018 for four nights, while we toured the Loire Valley. The location, just south of Chinon, was central to many of the best chateaux and wineries in the region, while providing a quiet, scenic farmland setting. I can't overstate how wonderful the accommodations are, beautifully and thoughtfully appointed by the owners, Steve and Tim. A partial list of the comprehensive amenities/supplies: bicycles, laundry facilities, a really comfortable bed and bedding, well designed and plentiful lighting, original artworks, satellite TV with English language stations, WIFI and a Mac, Bose sound system with a varied playlist (a nice touch when you sit down for a cozy dinner), cloth napkins, a kitchen you can really cook in as well as an herb garden, two types of coffee makers, a cool Italian toaster, a refrigerator pre-stocked with the basics, a huge bathroom with fluffy towels and fabulous shower, a 180-degree view that includes the local chateau on the other side of the valley, an outdoor seating area, and lots and lots of charm. The studio apartment is not large, but it seems very spacious and comfortable. And finally, Steve and Tim are fun, helpful, and gracious hosts. We have rented many houses/apartments over the years and this property ranks at the very top of the list. If you long to experience the French countryside rather than the hustle and bustle of Paris or Nice, the Old Barn in Lerne is where you need to be. This was the best vacation spot we have ever found, without qualification. We were warmly welcomed by Steve and Tim on arrival and shown 'the lay of the land'...and knew immediately we were in for a wonderful week. We found in the kitchen a 'just from the oven' frittata made with squash from their bountiful garden, a selection of breads and croissants, cheese, ham, eggs, homemade jam and wine!! Such a treat after a day of travel. Our days were spent exploring the surrounding towns and we took a day to drive to Ile de Re for lunch on the coast. Our hosts were gracious enough to take us along for the Foire aux Vins du Val de la Loire in Bourgueil (it takes place on August 15 of each year and how lucky we were to be there for that experience!) as well as the weekly Farmers Market in Chinon, where we selected items for our dinner that evening which was prepared by Steve and Tim. As an avid cook, I was thrilled to be able to participate in the preparation and learned so much in the process! Steve is quick to share his methods and the result is simple food which is exquisite. We can't recall a better meal or setting, since the weather allowed us to enjoy dinner outside with our hosts. If there is a quieter place on earth, we haven't found it yet! No automobile or airplane noise, horns, sirens or anything else disturbed the peace. And the view is spectacular, looking out on sunflower, wheat and corn fields. I think the vehicles we saw most often were tractors, as the farmers went about the business of harvesting their crops. If we are fortunate we will one day be able to return to this wonderful, relaxing, welcoming place. We met Steve and Tim as strangers but left feeling like old friends. They are gracious hosts and have turned their little spot in the world into something magical and memorable. Look no further if you are looking for that perfect spot in the Loire Valley to enjoy the France that a lot of visitors never get to see. One of the reasons we wanted a vacation rental was to be able to share our special place in the Loire Valley and to meet interesting, nice people from all over the world. It often ends up in making friendships that last; and Laurie and Bill were so pleasant to be with, it really felt like after day one they were family or old friends. We sincerely hope that our paths will cross again. Any vacation rental owner would be very lucky to have them as guests! We spent 5 nights here in Lerné towards the end of May. We arrived around 6:30 on a Friday evening and received a warm welcome by the owners, Steve and Tim. They showed us all through the apartment, and we were delighted and surprised to find that they had prepared an excellent simple meal for our supper and also provided bread, butter, jam, yogurt and ham for breakfast. This was a real treat and much appreciated! They were also extremely helpful about explaining which local markets to check out, where the nearest patisserie was, and where to find good nearby restaurants. Needless to say, they also provided excellent advise, both written and in person, about local sights to visit. Steve and Tim were friendly and helpful without being in the least intrusive, and we really enjoyed our conversations with them. The apartment is on the upper floor of a converted barn, which is part of a small compound that includes Steve and Tim’s house, and another building which has a lovely deck with great views that we were welcome to use. The compound is several hundred yards off the main road but there is a narrow paved road to reach it. Lerné proper is on the other side of the main road so the compound feels pleasantly secluded. The open plan apartment has comfortable furniture, an excellent bed with very nice linens, and an extremely well equipped kitchen for those who enjoy cooking. The view towards the east includes the Château de Coudray-Montpensier, which is marvelously sited to be the last thing lighted be the sun at dusk (Steve said this was true year-round). Otherwise, there are cultivated fields immediately to the east and south and lovely vistas in all directions. Sunrise is spectacular, and well worth getting up for. There are of course many sights to see in the area—more than we had time for—but we particularly enjoyed the Chateau du Rivau, the gardens at Chateau de Villandry and the lovely town of Saumur. But we had at least as much pleasure in simply spending time peacefully on the property, or taking long walks nearby. All in all, this was one of the best vacation stays we've had in many years of traveling. Our thanks to Steve and Tim for creating such a beautiful and welcoming home and for being such wonderful hosts. The Loire Valley, also known as the 'Garden of France” has been blessed by temperate weather and good soil. Here, France’s royalty built a thousand chateaux, some of the world's finest, and a short distance from Paris. Bank Transfers, Euro or US Dollar personal checks. PayPal with a 5 percent additional fee.